Recently at my children's school, the parents arranged a surprise breakfast for the teachers to express our gratitude for all their hard work. We all brought a dish to contribute to the brunch buffet. I wanted to take something that was savory and took this Sheet Pan Spinach Quiche. A long time ago I had shared a recipe for Spinach Quiche. I continue to make this quiche but now use a different crust. The crust I now use is half of the crust recipe below with the exception of mixing in some whole wheat flour. 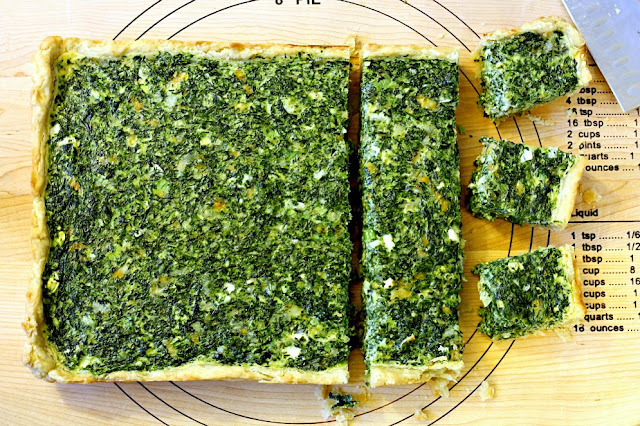 This Sheet Pan Spinach Quiche is for a larger crowd and very simple to make. It is double the recipe of the original Spinach Quiche I had previously shared. This quiche can be enjoyed hot, room temperature or cold. Line a 9x13 inch baking pan with parchment paper or foil. Spray with cooking spray. Transfer to a lightly floured surface. Roll into a rectangle and transfer to prepared pan. With hands, push the dough to cover the pan and to come up the sides. Using a mixer fitted with the paddle attachment, beat cream cheese until smooth and fluffy. Add the milk and mix. Beat in eggs two at a time. Squeeze out as much water as you can from the spinach. Add the spinach, cheddar, green onion, salt and pepper to the mixer and stir. Add the filling mixture to the prepared crust. Bake for 25 minutes or until filling is set. Let cool for 10 minutes. Cut into squares and enjoy. Store any leftovers in fridge. love a crowd friendly brunch recipe!